Thank you Randy Goldberg, President of Working Nurse Magazine for their letter in support of establishing an Office of the National Nurse. I want to inform you that Working Nurse Magazine , after careful analysis and consideration, has decided to fully support the initiative put forth by the Office of National Nurses to have a Chief Nurse Officer within the Office of the Surgeon General. We have concluded that this initiative is of great importance in helping to improve healthcare within the United States. We are hopeful that you will reintroduce legislation that would create the Office of the National Nurse. Working Nurse Magazine is an organization that is in touch with over 150,000 registered nurses in the Southwestern portion of the country. We are well aware of the issues and challenges that are faced. Having a full time Chief Nurse Officer embedded with the Office of Surgeon General will bring more visibility to all of those nurses who are already on the front lines the nation’s healthcare system, and to all of the tens of thousands of future nurses that this country needs. Nurses need an advocate at the highest level of government. Please use this letter as our recommendation of legislation that would accomplish this important goal. Members of the National Nursing Network Organization’s Board and supporters traveled again to DC! Joining us for the first time was Sheryl Oakes Caddy, nurse educator and nurse attorney from Oregon. After learning of this initiative during Alisa and Teri’s keynote address at The American Association of Nurse Attorneys annual conference, Sheryl has become an active supporter. TAANA members have been great in continuing to offer their support since endorsing the ONN initiative. Although we missed the Cherry Blossom Festival by 1 week we did make 15 in person visits and delivered several dozens packets of information to Congressional offices. We want to thank those who made this trip possible for their gracious donations and support-without you we could not have traveled so far and been such a presence! We were particularly impressed with the amount of work that is being done in Congress by our elected officials and their legislative aides, as well as by our nursing leaders in HRSA, on economic recovery and health care reform. Despite everyone being so busy, they took the time to meet with us and were interested to hear how the ONN initiative fits with the renewed focus on prevention. “Two January articles, "The Top Nursing Story of 2008: Why Can't Nurses Just Get Along?" (In the News) and "The Initiative to Create a National Nurse: Stalled" (AJN Reports), have striking similarities. It's disappointing that our nursing leaders don't support the establishment of the Office of the National Nurse, which would clearly benefit our profession and improve public health. Walker, K. (2009). Who's leading nursing? American Journal of Nursing . 109, (4), pp 12. Let’s not miss this golden opportunity to be major players in the momentum for realistic national health care reform. This is a genuine priority for the Obama administration who sees prevention as a cornerstone for meaningful change. Nursing has a significant national role to play promoting health and preventing illness and this is the time for nursing to speak with one positive, powerful, supportive voice. That’s why I am troubled to read of organized nursing’s rejection of the proposed Office of the National Nurse, as reported in the January 2009 AJN Reports: The Initiative to Create a National Nurse. Their arguments seem disjointed and inconsistent. For example, M. Elaine Tagliareni, president of the NLN and speaking for the Tri-Council essentially says why “create a brand new office when we already have a chief nurse officer of the USPHS.” And that, to me is the point. Now-to all nurse readers everywhere- Quiz time: Quick!! Name the Chief Nurse at USPHS and list one major achievement of 2008. Hmmm. I thought so. Neither can I. And yet- wouldn’t the easiest action be to elevate that position to full time, give that professional the opportunities to reach out to the public, and put a public face on nursing? As Carol Lindeman said, “nurses are knowledge workers.” Let us use that knowledge to work with the public. We need someone, full time, to advocate for nursing involvement in health policy, someone to provide leadership for nursing in a way that both enhances the profession and strengthens nursing’s involvement in health care issues. We need someone whose examples of leadership and advocacy emphasis the vital importance of nursing to the health of the public. Such effectiveness would be a natural recruitment tool as well. We need the Office of the National Nurse. We need a qualified professional to work in a complementary and very visible way with the Office of the Surgeon General, especially since President Obama is considering a highly regarded physician with media experience as Surgeon General. This will be a natural partnership for nursing. One of ANA’s objections is that the proposals for health education “are limited to simple messages.” Why is this bad? Isn’t the health message on a pack of cigarettes a simple one? Isn’t the message to floss and brush your teeth a simple one? And what about the simple message to counter childhood obesity, to turn off the TV and go out and play? The Office of the National Nurse builds on precedent. Look at the careers and accomplishments of Lucille Petry Leone and Faye Abdullah. Look at the leadership of Margretta Styles, who provided the blueprint for the Office of National Nurse almost 25 years ago, when she encouraged nurses to exercise their leadership potential in national and global health. Her dream for nursing included a strong image and a unified voice for nursing. Styles envisioned a nurse as Director-General of the World Health Organization and inspired us by quoting Nightingale: No system shall endure that does not march. Let’s take another look at this proposal and all the good that it can do. Let’s acknowledge that great ideas can come from unexpected places, and that a National Nurse has much to offer the American public. Patricia Van Betten RN, MEd. We look forward to hearing your opinions and welcome your feedback in the Comments section of this posting. If you desire a response, be sure to insert your email in the post. 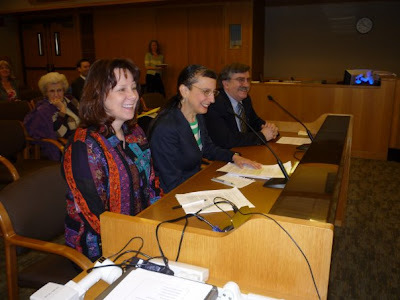 Friday, March 13, 2009, proved to be a very lucky day for SJM 5, the Joint Memorial in the Oregon State Legislature, urging Congress to enact legislation to create an Office of the National Nurse. Accompanied by activists and student nurses wishing to learn how the political process works, NNNO Board members and supporters returned to the state capitol in Salem to testify in favor of SJM 5. "America’s healthcare system is in serious trouble. Nurses are galvanized by the ONN proposal and want to make a difference. We are the largest sector of healthcare. We have unique and special skills and insights to offer the public. We understand that preventive medicine is better than reactive medicine; that quality of life matters. An Office of the National Nurse would possibly be the most significant way to utilize our collective vast wealth of knowledge to improve our nation’s health. And we hope that you, as concerned health care consumers and esteemed elected officials will join us so that the Office of the National Nurse will become a reality in our lifetime." The vote was taken and SJM 5 passed unanimously out of the House Health Committee. This resolution passed on the floor of the Oregon House of Representatives on March 19th by a vote of 55-2. Oregon joins the state legislatures in Massachusetts, New York, and Vermont who previously had passed similar resolutions urging the US Congress to enact legislation to establish an Office of the National Nurse. 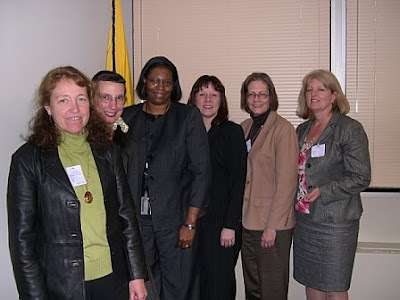 During Public Health Week, April 6-12, 2009 the National Nursing Network Organization (NNNO) signed on to the American Public Health Association's (APHA) efforts to strengthen public health as the foundation for healthcare reform. Supporters of the campaign to create an Office of the National Nurse will be inspired by the APHA's newest video Healthiest Nation in One Generation. The video can be viewed at http://www.generationpublichealth.org/ . The Board of Directors of the NNNO encourages all nurses to share this public health video with friends, family, and co-workers as we support the APHA theme "Building the Foundation for a Healthy America." The supporters of the Office of the National Nurse (ONN) initiative wholeheartedly agree. The ONN will stand as a focal point of preventive practices in the future of healthcare reform. Just as nurses work alongside physicians and other health care providers, the ONN would assist other federal agencies to meet their stated goals of prevention and wellness. We are proposing the ONN be the vehicle for the delivery of the prevention and wellness message that our nation desperately needs to stave off the epidemics of chronic, preventable conditions. Nurses use education as a cornerstone of care, no matter what setting they work in. We are the health professionals, front line educators, and as we are 2.9 million strong and growing, we would be a vast and powerful tool for improving health literacy by reaching across a broad and diverse population. Elevating the Chief Nurse of the USPHS to be the National Nurse will be a significant step toward recognizing public health and toward the APHA goal of building the foundation for a healthy America. Senate Joint Memorial 5 , a resolution urging the United States Congress to enact legislation to create an Office of the National Nurse passed unanimously out of the Health and Veteran's Affairs Senate Committee on February 19, 2009 before it was sent to the House Health Committee, with final passage late last month. "The establishment of the Office of the National Nurse would set a new standard for a more accurate and realistic recognition of nursing's importance to health and healthcare in the United States. If the federal government enthusiastically and publicly embraced nursing, making its crucial contributions crystal clear, perhaps the public, the media and the private sector would all then have a greater understanding of, and appreciation for, the multitudinous ways in which nursing impacts the health of millions of Americans. Most importantly, however, the establishment of this office would certainly bring an important voice even more strongly to the ongoing conversation about health and health care in America. A National Nurse could, in effect, deliver a unified message of preventive health at a time when millions of Americans---including millions of children---live without health insurance or access to regular primary care. At a time of crisis and uncertainty for the health of the country, the Office of the National Nurse could very well be a stabilizing and empowering voice of reason and prevention."